The northern colletes is a solitary bee, meaning that a single female constructs and provisions a nest. It is the only bee species which is more widespread in Ireland than in Britain. The species was recorded in 2003, the first Northern Ireland record for 70 years. Colletes bees are medium-sized, rather slender bees. The abdomen is black with a narrow white band on each segment. The upper side of the thorax and the face are clothed in fox-coloured hairs. Males and females are similar in appearance. Adults of the northern colletes are active from mid-June to late August. The male bees emerge first a day or two before the females. The females are probably mated soon after emergence. The male then dies and the mated female constructs a nest burrow. Within the burrow, the female makes individual cells each provisioned with nectar and pollen and in which she lays a single egg. Females will tend to lay in proximity to others, so nest aggregations are formed. The larvae feed on the provisioned food before pupating the next year. There are several Colletes species in Ireland and identification requires specialist knowledge. Microscopic examination is needed to confirm identity where more than one species may coexist in an area. Adults can be seen on coastal sites in gently sloping or flat ground in dry dune slacks, in June, July and August, although the precise phenology in Northern Ireland is unknown. Nest aggregations are identifiable by the presence of holes which in suitable weather will have adults flying in and out. However there are many species of ground-nesting solitary bee and several species may construct their nests in the same place. Relevant access permissions should always be sought prior to visiting any sites. Nest aggregations were found at four sites on the north coast at Ballymaclary, Portstewart, White Park Bay and Bushfoot during a dedicated survey in 2003. These were the first Northern Ireland records since 1933, when it was found at Portballintrae. The species was also confirmed present at the Umbra in 2004. 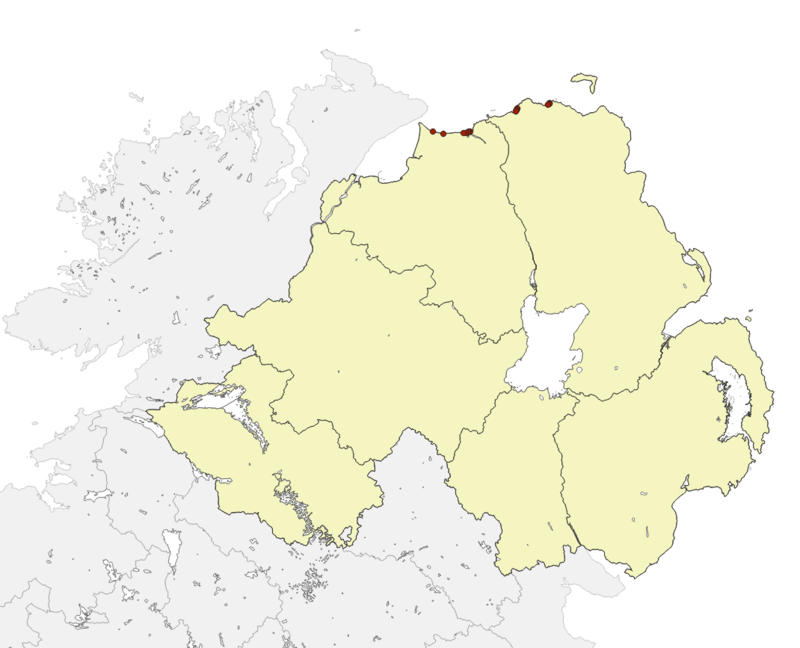 The largest populations found in 2003 were at Ballymaclary and Portstewart. None were seen at Portballintrae where there is no longer any suitable habitat. The species has never been seen on the east coast at Murlough and Killard Point, although suitable habitat exists, and it is widespread on east coast of Ireland as far north as County Louth. Listed as a UK Priority Species. Britain and Ireland together are thought to hold a significant proportion of the global population. The principal threats to this species are from loss of forage areas and nesting sites. These must be in close proximity (<500m). There is a UK Species Action Plan for this species which was published in 1999. Implementation of the Northern Ireland Habitat Action Plan for Coastal Sand Dunes. Maintain populations at all known sites. Sears, J. and Hunter, J.M. (2005). The re-discovery of the rare mining bee Colletes floralis Eversmann 1852, in Northern Ireland in 2003. Irish Naturalists’ Journal 28: 53-58.